What was one of the first things Sean McVay did when he became head coach of the Los Angeles Rams? He went to Jared of course. No, I don’t mean Jared, the “Galleria of Jewelry”, to buy his girlfriend a ring (sorry to disappoint you ladies). Instead, he went to Jared as in Jared Goff, the Rams quarterback who had become somewhat of an enigma, to discuss what had taken place in his rookie season. Goff, and Eagles quarterback Carson Wentz, were both taken as the #1 & #2 overall picks, respectively, in the 2016 NFL draft. And while rookie quarterbacks generally go through some growing pains in their first year, the general feeling around the Eagles at the end of last season was that the drafting of Wentz was the right decision. Unfortunately, the same could not be said of Goff. The Rams were dead last in the league in scoring last season, with Goff starting the last seven games and throwing 5 touchdowns and 7 interceptions with a passer rating of 63.6, which did nothing to inspire confidence that he was the bona fide future QB of the team (ironically, the starter for the first nine games was Case Keenum, who is leading the Vikings to a 10-2 start this year). As for Sean McVay, he is not just another rookie coach, but was the youngest coach in NFL history at 30 years old when he was hired (he is 31 now) after spending the last three seasons as the Redskins offensive coordinator . And while experience can be a big advantage in the NFL, McVay has proven that it can be overrated, as the Rams are tied with the Eagles for the #1 scoring offense in the NFL. But to make sure that McVay has some quality experience around him, his defensive coordinator is Wade Phillips, who at 70 years old is old enough to be McVay’s father, and was the defensive coordinator for the Eagles from 1986-1988 during the Buddy Ryan years. As for the Birds, I don’t know about sleepless, but their movie should be aptly named “Sloppy in Seattle”. Perhaps it was the four consecutive blowout victories that preceded the Seahawks game that had them thinking they just needed to show up to win. Or maybe there was too much attention paid to whether the defense would be doing the 1) Cha-Cha Slide or the 2) Cupid Shuffle as a follow up to the “Electric Slide”. Whatever the reason may be, last Sunday’s game could best be described in three words: SLOPPY, SLOPPY, SLOPPY. But have no fear Eagles fans…there is no reason to jump off the bandwagon or cancel your flight to Minneapolis in February just yet. The silver lining in all of this is that no team, in a 16-game schedule, comes fully prepared to play every week. And it wasn’t a case of the Eagles being overmatched by a veteran Seattle team. Even with all the sloppy play, the Birds had chances to win the game. In the 1st quarter, Carson Wentz overthrew Nelson Agholor on a pass that may have resulted in a touchdown. He usually makes that play. Later in the game, another pass to Agholor is caught but underthrown. That same pass thrown in stride may have resulted in a touchdown. In the 3rd quarter, Wentz, while going in for the tying score, fumbles the football, which results in a turnover and a huge opportunity lost. Funny how, when you fumble the football while heading for the end zone against the “Bad News Bears”, the ball stays in bounds and is recovered by one of your teammates for a touchdown, but when you do the same thing against a good team like the Seahawks, it goes out of bounds and results in a touchback. Good teams create their own luck it seems. One pass overthrown, one underthrown, and a fumble at the goal line. Twenty-one points left on the field right there. Good teams like the Eagles don’t make those kind of mistakes. The good news about this Sunday’s game against the Rams is that, while it is technically a road game, it may not actually feel like such. 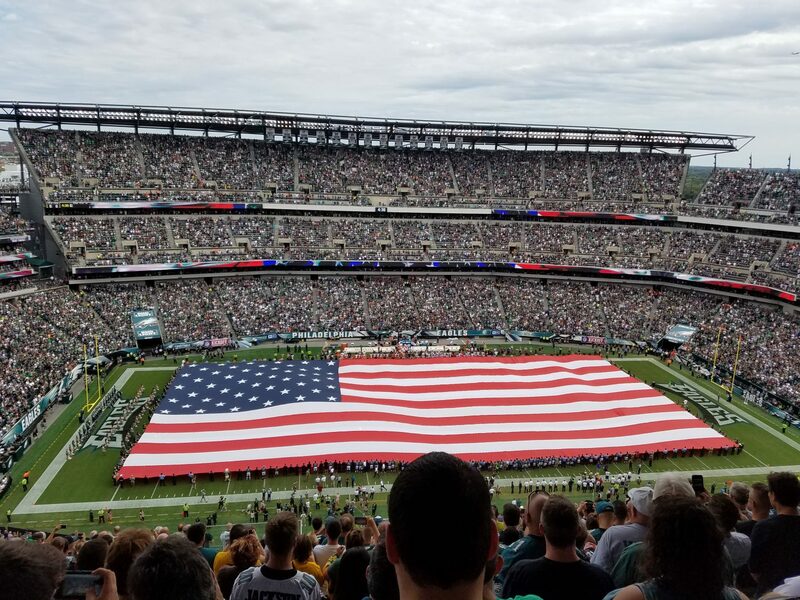 Much like the game against the Chargers two months ago, it may be a stadium filled with rabid Eagles fans (including yours truly). The Rams seem to think so, as they have been practicing with a silent count this week, which is usually only needed when playing on the road in a hostile environment. The fact that the Eagles may have a home-field advantage out in LA is both a blessing for them, and a sign of how pathetic the idea of keeping an NFL team in Los Angeles really is. The Eagles will gladly take all the help they can get, as after last week’s loss, they now find themselves playing in a game this Sunday that will have HUGE playoff implications. Win, and they will keep their #2 conference seed with a chance to move back up to the #1 spot, should the Vikings slip up on the road against the Panthers on Sunday afternoon. A first round bye comes with a week of rest and relaxation and the comforts of possibly never having to leave home. Lose, and the Eagles will fall to the #3 and maybe even the #4 seed, if the Saints can defeat the Falcons on the road Thursday night. Lose, and the result could mean a more precarious route to take on the road to the Super Bowl, with land mines at every turn. That’s how important a win is this Sunday, even with four games left in the regular season. The Eagles will win this Sunday because Carson Wentz will not repeat the same mistakes he made last week. The Eagles will win this Sunday because their Prince Harry look-alike QB will carry this team on his shoulders. Birds win 38-20. And the Enchanted Season WILL continue. Probably not, because there is really not much to tell, save for the mid-1980’s when Buddy Ryan became the head coach of the Eagles after leaving his job as the defensive coordinator for the then Super Bowl champion Bears, and bickering with Chicago head coach Mike Ditka in the process, there is really not much history or bad blood between these two teams. There was, of course, the infamous “Fog Bowl” playoff game back in 1988 in which a thick fog covered Soldier Field during the 2nd half of the game, which prevented the Eagles from mounting a comeback and advancing in the playoffs (speaking of fog, many parents I’ve talked to are sometimes in a “fog” as to how to approach the subject of the birds and the bees with their children, but I digress). When the NFL schedule came out, most looked at this game just like any other in terms of the opponent. And that’s all it is, save for the fact that the 2017 edition of the Eagles is very, very good. So this week we have birds, bears, no bees, but a plethora of turkeys, being Thanksgiving and all. Last week, after crossing the Betsy Ross bridge and driving down Route 90, I happened to spot not one, not two, but FIVE turkeys at the side of the highway (no joke), with two of them sitting on the highway railing as if they were waiting for an Uber to pick them up. One can only assume that they were scrambling to get out of town before they became the main course at someone’s dinner table? Then Thanksgiving came and while we now have three football games to watch if we desire on the holiday (which is probably not a bad idea just to distract us from having the “elephant in the room” conversation of whether you are pro-Trump or anti-Trump), only one of them was one I considered to be a marquee matchup going in (Vikings at Lions as the appetizer game). Every time I think Minnesota is primed to lose, they keep winning. And not only winning, but doing so with Case Keenum, who has been a journeyman mostly shuttling back and forth between the Houston Texans and St. Louis/Los Angeles Rams until this season, when he signed with the Minnesota Vikings to be their backup. An injury to starter Sam Bradford (surprise, surprise) opened the door for Keenum, who has not relinquished his starter spot even though Minnesota’s previous starter, Teddy Bridgewater, has been cleared to play and is waiting in the wings for Keenum to screw up. Even on Thanksgiving, which is Detroit’s chance to “be seen” (since the Lions don’t get much national TV exposure), the Vikings stole the show and won 30-23, staying on the Eagles heels for that highly coveted #1 seed in the NFC. Next up was the Cowboys – Chargers game, and while those of us in the Delaware Valley usually have a rooting interest in the Cowboys losing on Thanksgiving, this year I was perfectly content to shut off the television and discuss more interesting subjects such as 1) Why politicians don’t want to give us the ability to buy health insurance across state lines & 2) Using your airline miles to fly in business class to far flung destinations. This season, the Eagles are playing the role of the “Road Runner” with the Cowboys playing the role of “Wile E. Coyote”. And while the head coyote (Jerry Jones) thinks he’s a “super genius”, his team has been left way back in the dust, even without the use of an “Acme anvil” like in the cartoons. Then there was the Giants – Redskins contest as the nightcap, to which even most “New Yawka’s” were saying, “FUGETABOUTIT”! This game used to be a regular NFC East classic featuring the likes of Giants linebacker Lawrence Taylor facing off against Redskins quarterback Joe Theismann. Nowadays, the closest you’ll get to intrigue between these two teams is watching these two in a strange commercial where Taylor asks Theismann if he wants a turkey leg, to which Theismann replies, “I’m ok, thank you very much”. For those who may be too young to remember, this was a bizarre exchange, to say the least, because it was Taylor who broke Theismann’s leg in a Monday night football game 32 years ago, ending his career. As for the Eagles, they probably got to enjoy Thanksgiving like the rest of us, feasting on turkey on Thursday while also hoping to feast on bears on Sunday. Chicago, like the Eagles last season, come in with a rookie quarterback who was the 2nd overall pick in the NFL draft. And while Mitchell Trubisky holds a lot of promise for the future, he is learning the ropes of the NFL in a “trial by fire” method. After this game, the Birds will enter one of the toughest stretches of their season – three straight road games which will take them to Seattle and Los Angeles before ending with the Giants in the swamp lands of North Jersey. A win against a “not ready for primetime” team with a 3-7 record like the Bears is something that good teams like the Eagles should pull off rather easily. The Birds do so, knocking the stuffing out of the Bears in their last home game before Christmas night, winning 37-20.